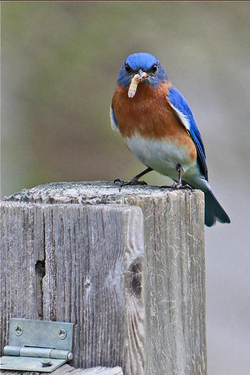 Watch for bluebirds and many other species during the Great Backyard Bird Count, an event sponsored by Stephen F. Austin State University's SFA Gardens and the university's student chapter of the National Association for Interpretation. The free event is scheduled for 9 a.m. to noon Saturday, Feb. 17, at the Pineywoods Native Plant Center. NACOGDOCHES, Texas - Stephen F. Austin State University's SFA Gardens and the university's student chapter of the National Association for Interpretation are sponsoring the Great Backyard Bird Count from 9 a.m. to noon Saturday, Feb. 17, at the Pineywoods Native Plant Center, 2900 Raguet St. This free, outdoor event will have activities designed to increase knowledge and appreciation of birds for youth and adults. A variety of family-friendly, hands-on learning activities will be set up, including using binoculars, learning bird identification skills, playing bird games and making bird-related crafts. In addition, there will be opportunities to participate in the national Great Backyard Bird Count as participants count birds for science with assistance from the Pineywoods Audubon Society and Texas Parks and Wildlife Department non-game ornithologist Cliff Shackelford. Shackelford will lead guided hikes along the trails of Tucker Woods at the PNPC. "Birdwatching is fun for all ages, especially as a family activity, and our area hosts a lot of fascinating species," Shackelford said. Winter is the ideal time for bird watching and the PNPC is a haven for local birds. Participants should wear comfortable walking shoes and weather-appropriate clothing. The Cornell Lab of Ornithology, National Audubon Society, Bird Studies Canada and many international partners are leading the Great Backyard Bird Count. The count is powered by eBird and made possible in part by founding sponsor Wild Birds Unlimited. For more information, call (936) 468-1832, or email sfagardens@sfasu.edu.